This article originally got published in French in Dragon Special Aikido in March 2017. Ma-ai (間合) is one of the many basic concepts found in Budo / Bujutsu. Often translated as the distance between Tori and Uke, a better translation could simply be an interval, since the term 間 is used equally for an interval of space and of time, whereas the character 合 conveys the notion of harmony and can also be found to form 合氣. I have a special interest in characters etymology, and these are no exception. 間 can be divided in two parts: 門, door and 日, sun. Looking for older versions of the character we can find 月, the moon, instead of 日. From then on it is easy enough to imagine the light of the moon passing through the gap of sliding doors. 合 is no less interesting since the upper part conveys the idea of ​​grouping while the lower part conveys the idea of ​​a mouth and therefore the gathering under a single voice. Simultaneously time and space, ma-ai is both what links us and separates us, it is this distance between us and the time necessary to cross it that creates a relationship between us and therefore possibly a confrontation. A ma-ai too big and the fight has no reason to be, too short and it is probably already too late. We all have a safe distance, a circle that surrounds us and in which no one should enter. This is true for every individual in everyday life, even more so in a martial context where letting someone come in our distance can imply death. But this distance depends on several elements and is rarely the same for both opponents, as it is governed by the fact of being able to touch and a combat is not necessarily symmetrical. In a symmetrical context where Uke and Tori use the same weapons, the distance is almost identical for each. A change of this element will necessarily involve the end of the symmetry. If my opponent is armed with a sword and I am not, his distance is longer than mine and he can touch me from further. Even with bare hands, two opposing opponents of different sizes will have a different ma-ai. Understanding my distance and that of the other is a necessity not to expose oneself unnecessarily to danger and to win the confrontation. Controlling distance is essential and involves knowing the advantages and disadvantages of each weapon or specialty. This is true in traditional arts, regardless of their country of origin, as in combat sports. A judoka and a boxer although both fighting with bare hands have indeed a very different ma-ai. Unlike what one would be tempted to believe distance is not a constant factor and what is considered a distance of safety or comfort evolves according to a certain number of elements. Living in one of the most densely populated places on the planet, my comfort distance is for example deeply reduced to its bare minimum much of the time. It changes however immediately if I choose to leave the city to find myself in a deserted place. Who among us did not feel assaulted at the beach when a stranger came sticking his towel to ours while a few days before in a cafe or in public transport this same distance was not a problem ? The acceptable distance depends on the context, and also within a martial context of our ease. It is not uncommon to see beginners attacking at a longer distance than what would actually happen, and to see Tori use a large Tai Sabaki to get as far away as possible from the danger zone before applying his technique . The more practitioners progress, the more attacks tend to get closer, putting Tori more under pressure. Tori learns to better manage the distance and to get out of the dangerous zone with just the minimum that is needed. If we return to the etymology of the character Ma (間), it is easy to imagine that it is a question of going out the exact same way the light passes through the interstice of the door. Too close to the attack is obviously too short, while going too far out will give the opponent the opportunity to modify his attack. It is the same with timing since if going out too late is obviously problematic, moving too soon is not better. An optimal use of time and space will not only take the opponent at the right time but also using the best levers. 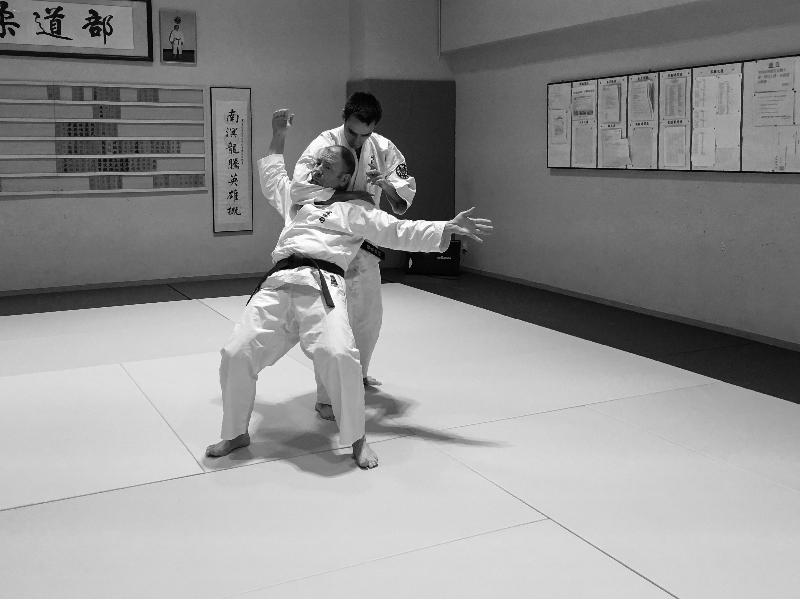 In the practice I propose to my students, I recommend to go out just enough not to be affected by the strike, sticking to the opponent so that each movement they make make has an impact on the opponent’s structure. The distance is thus reduced to its strict minimum. It has two pedagogical benefits from my point of view. First of all, accepting or welcoming an attack goes against our natural intuition and this work allows us to desecrate what the attack represents and to move away from this fear that keeps us from moving freely. Then sticking to Uke helps to harmonize with him, as out two bodies become one, thus learning how a movement on my side will have an impact on him. A good ma-ai, in terms of space and timing gives the best results. We often hear that controlling the distance means controlling the fight, which seems obvious since controlling the ma-ai means being able to touch without being touched. Disrupting the opponent’s mai-ai by entering his distance and offering him an opening to provoke his attack is, for example, a good way of controlling the ma-aï and restricting his options by encouraging a particular attack. Controlling the distance means not undergoing it. In general, in a fight, the two protagonists try to bring their opponent in their distance without entering theirs. Blind spots typically enable to reduce my distance to my opponent without giving him any opportunity. Being in a position where we can hit wothout being hit is obviously ideal. If blind spots lead immediately to think of the ma-ai from the point of view of space, intention and initiative enable us to take it from the point of view of timing. In Go no Sen, for example, Tori moves after the attack is initiated, but nothing stops Tori from having created this attack by his previous action. The attack is no longer a surprise but just a trap in which Uke fell. Take as an example Shomen Uchi Ikkyo (Robuse), Uke attacks Shomen Uchi, Tori responds by Ikkyo. But why does Uke use Shomen Uchi in the first place, and can I make him perform this attack? Let’s reverse the situation. As Tori, what can I do to make this configuration (Shomen Uchi Ikkyo) happen? I can for example break the distance, and attack Uke’s eyes to encourage him to protect himself with his arm. At the moment of contact we are now in a situation very similar to the original one, but with an inverted power ratio. If training on basic forms is essential, I believe it is important for every practitioner after a few years to try to put things back in context, especially from a tactical and strategic point of view. The basics are what they are, basics. It is up to the practitioner to use them as a foundation to go further. Butin my opinion, it is in Sensen no Sen that working on intention is the most difficult, since Tori needs to react to the moment when the idea of the attack is born in Uke’s mind. Before its execution. More than just a question of space, timing is key here to control the fight, and as the saying goes “slow and steady wins the race”. 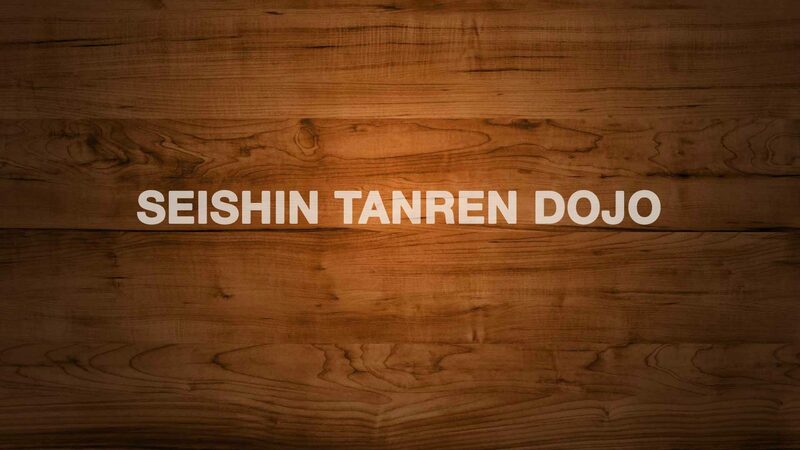 In Nihon Tai Jitsu, there is a kata (Nihon Tai Jitsu no Kata Sandan) based on Kaeshi Waza and Sensen no Sen. In this kata, Tori systematically performs the first attack in response to the immediate threat posed by Uke. Imminent threat shown in the kata by a slight movement of the fists. As this a form, the attitude is obviously formalized but the work proposed by the kata can, and must, go further. That means Uke must on the one hand learn to hide his intention, and strike when he wishes, without giving any warning sign, and that Tori must in parallel learn to read when the attack will be launched to act beforehand. With a bit of practice, one can quickly start reading body movements that show the beginning of an attack. However this is still later than Sensen no Sen, as the ideal situation would be to move before any physical sign appeared. This is extremely difficult as for every human being with normal eyesight, our main tool to perceive an attack is… our eyes. Yet, we have other senses we can train. 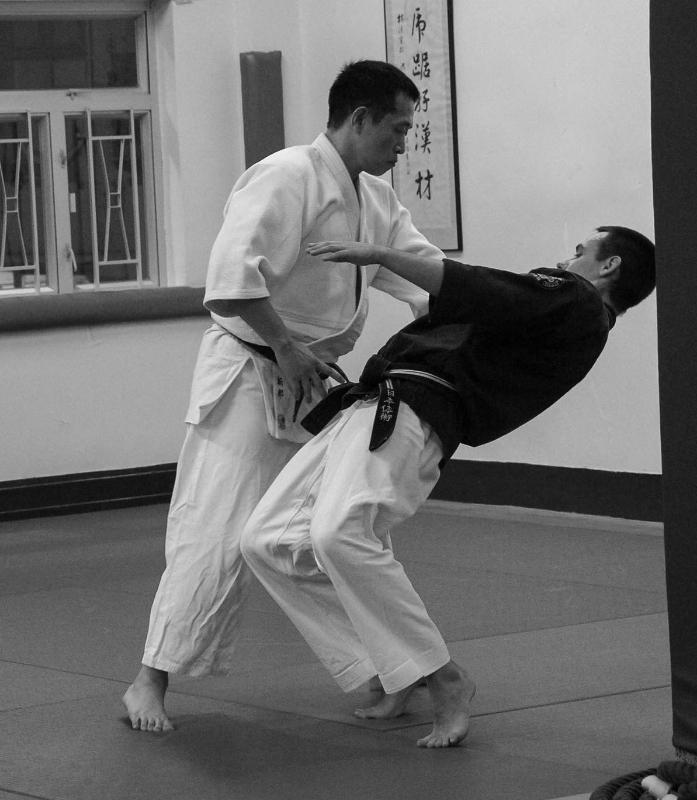 I invite you to train with closed eyes, with your partner attacking you slowly with an atemi. Then try to feel that something is approaching and try to react before the contact. This would be reacting to something you felt, but did not see. Of course you will not succeed every time, but let’s be clear, no one improves by succeeding, improvements come by going out of our zone of comfort and exploring things we thought were impossible for us. 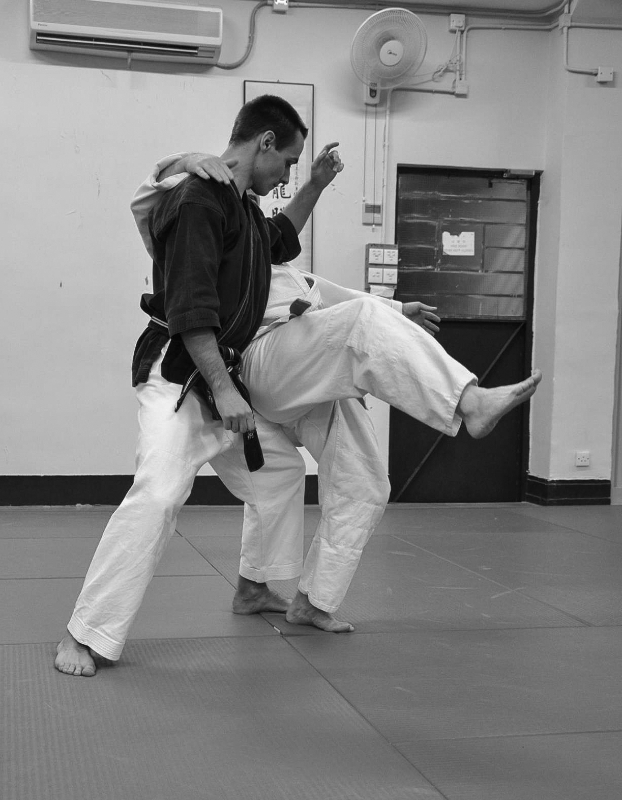 Nihon Tai Jitsu is an empty handed martial art developed to handle several fighting distances: a long distance for strikes, medium for locks, short for throws and constriction techniques. The defenses against weapons complete this approach of the distance by bringing up a longer distance but also an asymmetrical work. The founder of the discipline, Roland Hernaez, often says speaking of defenses against knife that it does not necessarily have to be a realistic self-defense work, but that the work with an armed partner presents a certain number of ” Educational benefits”. Partly because it is playful, but also because the distance necessary to touch Uke becomes longer while his own remains identical, thus increasing the constraints and therefore the need to enter correctly. The question will arise identically with different constraints when switching to longer weapons such as tambo or jo. Aikido, as many schools have perfectly integrated this notion by proposing many forms of asymmetric work: empty hands vs. jo, empty hands vs ken, jo vs ken, etc. Each configuration proposes new constraints and therefore a new learning.